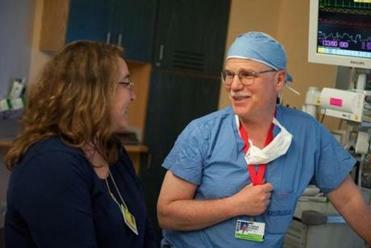 Dr. Joseph Madsen led the surgical team (left) at Children’s Hospital. After nearly seven hours of preparation, Dr. Joseph Madsen turned on the laser at Boston Children’s Hospital that would burn a tiny hole in the brain of 13-year-old Justin Griffin. The laser was on for only a minute, but scored a direct hit on the area Madsen thought was causing Justin’s weekly epileptic seizures. Twice more the surgeon pulsed the laser, and then concluded the operation was a success: The left hippocampus of Justin’s brain had been effectively destroyed and with it the catalyst for the boy’s disruptive seizures. Once a last resort for epilepsy because it was so difficult and risky, surgery is now a more viable option for patients of all ages. Recent ­advances in imaging have enabled Madsen and other surgeons to be more certain where ­seizures originate in the brain, which tissue they can cut safely, and how to minimize damage along the way. To be a candidate for surgery, a patient must have seizures that originate in one or two spots that doctors can clearly identify and cut out or disconnect from the rest of the brain. “Advances of imaging have really changed the way we think about things, turning children we didn’t think about as surgical candidates ­into surgical candidates — and surgery can be a cure,” said Dr. Elizabeth Thiele, director of the pediatric epilepsy program at Massachusetts General Hospital. 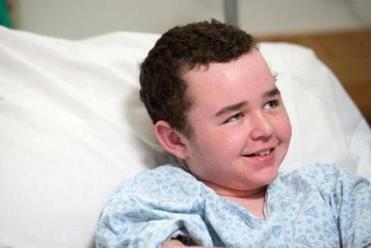 Justin Griffin, 13, after the laser surgery on his brain last month. Epilepsy is a neurological disorder in which patients suffer multiple seizures from electrical disturbances in the brain. The Epilepsy Foundation estimates that about 3 million Americans — about 1 in 100 — suffer such seizures. The scanning machines include a 7-tesla magnetic resonance imaging machine, which provides much higher level of resolution than a conventional MRI — like high-definition ­television compared to a conventional display. The 7-tesla image shows the internal structures of the brain in striking detail. Another ­technique, MEG, or magnetoencephalography, shows in three dimensions where spikes in brain waves are clustering in order to pinpoint the source of seizures. MRI tractography is ­another form of 3-D imaging that doctors use to determine the location of important functional areas of the brain, and whether the source of the seizures can be safely removed. The combination of those tests provides ­doctors with a much more complete picture of where seizures originate in the brain and how to get at them. “If you have one piece of data, you’re a little uneasy, but if you have three or four, you’re more confident,” said Dr. Ann-Christine ­Duhaime, a professor of neurosurgery at Harvard Medical School and director of pediatric neurosurgery at Mass. General. 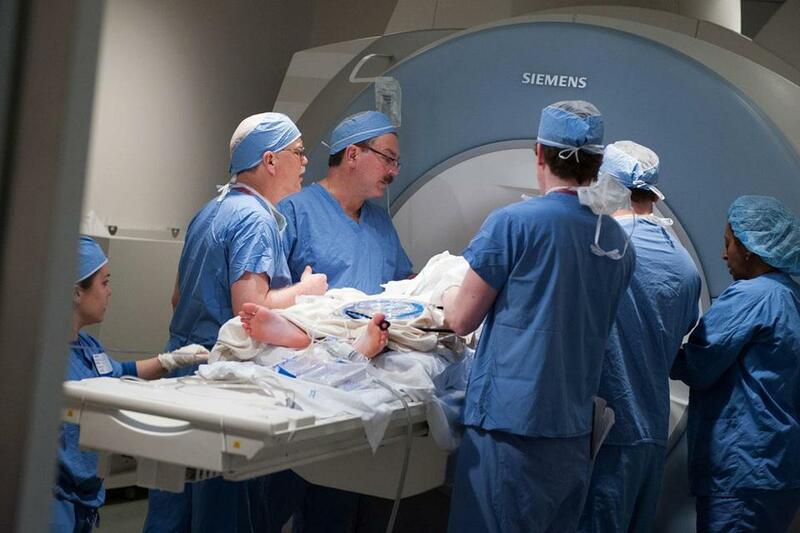 The Cleveland Clinic in Ohio is one of many hospitals around the country that is ­performing more surgeries for epilepsy because of advances in imaging technology. Imad ­Najm, the director of the ­clinic’s epilepsy center, predicted scanning technologies will continue to improve. Najm uses an MEG scanner and an MRI that can record the brain’s electrical activity, providing him with a more three-dimensional view than is available with other scanners. Najm and the Cleveland Clinic also have technology imported from Europe that enables him to ­robotically thread an electrical recording device deep into the brain. Used with other scans, this “stereotactic EEG” shows Najm electrical activity that otherwise is not detected at the surface, allowing more patients to undergo the surgery. “It’s extremely important to us to look at these new ­technologies and use them all together,” he said. Keren Griffin spoke with Dr. Joseph Madsen after he performed laser ablation surgery on her son, Justin. Anastasia Nickole, 10, benefited from that combination ­before — and during — her epilepsy surgery last fall at Massachusetts General Hospital. An MEG scan of her brain helped doctors find a focal point of her seizures, and her surgery was conducted in a surgical suite fitted with an MRI, so doctors could scan her brain as surgery began, and again afterward, to check whether they had taken out all the offending tissue. Before the surgery, the Saugus girl had as many as five seizures a day; in the four months since, she has not had a single one. She has also made great progress in school, and her voice is clearer and steadier. “Her focus, her ability to sit and listen is unbelievable,” said her mother, Kellie Nickole. At Children’s Hospital in late March, Justin Griffin became just the third epilepsy ­patient in New England to ­receive laser surgery, which ­researchers say is more precise than conventional surgery and has fewer complications and a quicker recovery time. Instead of peeling back a piece of skull, as with the traditional approach, surgeons drilled a tiny hole in Justin’s skull and, guided by the sophisticated imaging, threaded the laser along a safe path through his brain. Justin’s seizures originated in his left hippocampus, the part of the brain responsible for verbal memory. Madsen and other members of the ­medical team believed Justin would be fine without it, ­because their tests showed that the hippocampus on the right side of his brain had taken over most of its functions. The operation went so smoothly that Justin went home to Chester, N.H., the next day feeling a little dizzy, but with just three tiny Band-Aids covering the drill hole used for the laser and a frame to stabilize his head. Last Tuesday — only four days after the laser surgery — Justin was back among friends in his eighth-grade classroom. His mother, Keren Griffin, said Justin has not had any ­seizures so far, and she does not think he has lost any memories or motor skills. “I would highly recommend it to anybody,” Griffin said.